Rare book dealers working on recipe collections are in the enviable position to be able to do original work on unique and little-researched materials, and to learn from the collections they handle, as well as from collectors, whether private or institutional. Collectors’ ambitions to acquire interesting and rare material in as comprehensive a manner as possible (including later editions, which were, for a long time, considered inferior to the first edition) have made it possible to piece together at least part of the history of the cook book. It is important to understand that, as a genre, cook books really are rather complex: they were popular publications, and somewhat ephemeral in that they were constantly replaced with more fashionable versions, revised editions or new titles. 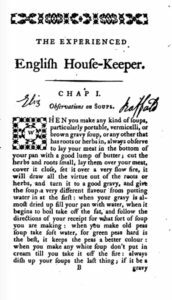 The example of one female cook book writer of the eighteenth century, Elizabeth Raffald, née Whitaker (bap. 1733, d. 1781), illustrates this point well. Image 2: Elizabeth Raffald’s woodcut facsimile signature, intended to prevent the publication of pirated editions. Elizabeth Raffald, The Experienced English Housekeeper, for the Use and Ease of Ladies, Housekeepers, Cooks, &c. Written Purely from Practice, and Dedicated to the Hon. Lady Elizabeth Warburton, whom the Author Lately Served as Housekeeper: Consisting of Near Nine Hundred Original Receipts, Most of which Never Appeared in Print… The Tenth Edition. With… Two Plans of a Grand Table of Two Covers; and A Curious New Invented Fire Stove, wherein any Common Fuel may be Burnt instead of Charcoal. London: R. Baldwin, 1786, p. 1. From archive.org: https://archive.org/details/experiencedengl00raffgoog. Raffald was a food writer whose books, among her other enterprises, afforded her much success. Raffald had her own shop for ‘cold Entertainments, Hot French Dishes, Confectionaries, &c.’ (ODNB), expanded it into a cookery school, ran two inns, and, with the publication The Experienced English Housekeeper, became ‘after Hannah Glasse, the most celebrated English cookery writer of the 18th century’ (Virginia Maclean, A Short-Title Catalogue of Household and Cookery Books Published in the English Tongue 1701-1800 (1981), p. 123 n1). The Experienced English Housekeeper is remarkable in many ways and, among other things, a landmark in the development of the English wedding cake, recording the use of marzipan and royal icing for the first time. It was issued in fifteen authorised editions between 1769 and 1810, but also inspired some twenty-five unauthorised editions. In order to prevent such piracies, Raffald issued her authorised versions with a woodcut facsimile of her signature on the first text page. Enthusiasm for Raffald’s work outlived the author herself, and a ‘new edition’ appeared posthumously in 1807, promising more additional recipes on the title than the text actually provides. Only a comparison between different exemplars, and detailed bibliographical information on other editions, can fully chart the authors’ attempts to protect their work and thwart others’ efforts to benefit from their popularity; the cunning imitations that yet bypassed these measures; and, amidst these struggles, the constant evolution of recipes, their ingredients and methods. And since many of these editions only survive in a handful of copies (due to their replacement, historical neglect or destruction by use in the kitchen), the collections that do preserve little known or rare editions are the best, and often only, means for the diligent bibliographer or bookseller to make such comparisons. 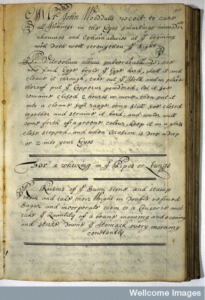 Manuscript recipe collections, by contrast, are unique by definition, and have long been very highly sought after, although not for all historical periods alike. In the late twentieth century, manuscripts produced before 1800 were the main focus for collectors, but more recently manuscripts from the early nineteenth century have also attracted much interest. No matter when acquired or how old, manuscript recipe books are often the defining features of the collections of which they form part. The Folger Library in Washington DC is, famously, home to the largest collection of early modern western European recipe books in the United States (see https://recipes.hypotheses.org/tag/folger-shakespeare-library for an example from the collections), and other collections prize their manuscripts on a smaller and perhaps more modern but, overall, no less significant level – see, for example, the New York Historical Society’s holdings of recipe compendia, extending to the 1950s to 1970s, all instructive in their own right. So how much is a recipe book worth? And is it worthwhile starting a collection today, now that collecting cook books, recipe collections and manuscripts is no longer a niche interest? For recipes as for any other collecting activity, it is the individual that makes the mark on a collection, beyond any perceived restrictions of a canon of literature or any financial constraints. One recent example for how collecting interests can flourish and develop is a young collector who won an honourable mention in booksellers Honey & Wax’s Book Collecting Prize: Ashley Rose Young, a doctoral candidate in history at Duke University, ‘began by collecting historic Creole cookbooks, then expanded her focus to the food markets of the port of New Orleans, a local economy historically dominated by African-Americans and immigrants’ . Further, it could be argued that some of Christopher Hogwood’s cook books were not collectibles when they first caught his eye, but have now, through their distinguished provenance, earned a place in other collections. Recipe books are, then, certainly a subject in which each collector can develop their own taste, and which will be valuable to their owners on many different levels. It also seems certain that they will continue to be valued in the book market, and that our knowledge of them will continue to grow over time, thanks to the endeavours of all those who handle them – be they private collectors, institutions, book dealers, or scholars. Dr Anke Timmermann FLS is a historian of science-turned-antiquarian bookseller, and the author of Verse and Transmutation: A Corpus of Middle English Alchemical Poetry (Brill, 2013). Anke joined Bernard Quaritch Ltd, one of the oldest antiquarian booksellers in London, after finishing her Munby Fellowship in Bibliography at Cambridge University Library in 2014. She recently set up as an independent bookseller (A T Scriptorium), and specialises, among other things, in the history of science, and recipe books including culinary, medical and alchemical recipes. She tweets as @ElixirLibri. My most enjoyable and extensive experience with recipe literature as a book dealer to date was handling the conductor Christopher Hogwood’s collection of books on food and drink in 2016. At the time, many who saw the catalogue expressed surprise that a man best known as a specialist in Neo-Baroque and Neo-Classical music would collect recipe books including a seventeenth-century manuscript explaining the preparation of pickled pigeons, hogs’ feet, early modern macarons, and ‘new College Pudding’; an eighteenth-century manuscript recipe collection that had once been part of the libraries of both the eccentric doctor-turned-food writer William Kitchiner (1778-1827) and, two centuries later, the food historian and bibliophile Eric Quayle; Hannah Glasse’s Art of Cookery, which appeared in a rapid succession of editions; a rare edition of John Davies’ Innkeeper’s and Butler’s Guide on the making and flavouring of British wines; and books and an autograph manuscript by Édouard de Pomiane, the 20th-century French physician, scientist, and writer and broadcaster on gastronomy, who was greatly admired by Elizabeth David. Hogwood’s library also included sets of Aga ‘Menus’ (periodical private press-styled leaflets with recipes and news for owners of Aga cookers) and orchestra cook books, i.e. recipes collected from and published by musicians to raise funds. There’s a lot of mystique about the original scores sort of thing, … even a certain amount of rubbish about playing music with authentic instruments. And I found that if you translate the business into a question of recipes and ingredients, people feel a bit more entitled to make comments. … Talking about music in terms of recipes gives rise to more speculation … people begin to talk about what it was then, what it is now, and what the reasons are for changing. And they start to see how, if you change one ingredient, it really affects the final shape. The dish will come out different: it may be perfectly edible, but it won’t be the dish that was described originally. And the same applies to music: substitute an instrument and a wrong sonority or style will result. 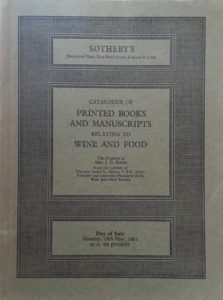 Image 1: Sale catalogue for André Simon’s collection, Sotheby’s, 18 May 1981. Hogwood (1941-2014) was one in a long line of collectors of works on food and drink (and related recipes – household, medical, veterinary – as well as other ‘how-to’ books on bee keeping, fishing or gardening) whose growing interest in the subject has not merely preserved, but rather recovered and broadened knowledge of recipe history. Many of the standard bibliographies on food and drink are, in fact, catalogues of private book collections, and therefore not intended to be complete, but rather to provide detailed descriptions of the exemplars in hand. They range from Katherine Golden Bitting’s early American Gastronomic Bibliography (1939; her collection is now in the Library of Congress), Eric Quayle’s entertaining Old Cook Books: An Illustrated History (1978; books from Quayle’s collection appeared at auction at Sotheby’s in 1997, and his collection was sold in two dedicated sales at Bonham’s in 2006) and the gastronomic polymath André L. Simon’s seminal Bibliotheca Gastronomica (1953), and Bibliotheca Vinaria (1913; selections from Simon’s extensive library were sold at Sotheby’s in 1972 and 1981), to William R. Cagle’s A Matter of Taste (1999), this last based on the institutional collection of the Lilly Library, Indiana University, which was a pioneer in its recognition of recipe literature as an important genre . Interestingly, in recent years, other libraries have caught up with private collectors, and developed their recipe collections significantly; however, this development was generally preceded and driven by the bibliophile tastes of private collectors. The evolution of cook book collections has significantly influenced the way in which rare book dealers have been able to identify valuable items (both printed and manuscript), to rescue them from potential obscurity or destruction, and to find new homes for them. And the consequent development of the book market has made it possible for anyone with an interest in recipes and books to become a collector. How so? Read more in tomorrow’s second part of this blog. Dr Anke Timmermann FLS is a historian of science-turned-antiquarian bookseller, and the author of Verse and Transmutation: A Corpus of Middle English Alchemical Poetry (Brill, 2013). Anke joined Bernard Quaritch Ltd, one of the oldest antiquarian booksellers in London, after finishing her Munby Fellowship in Bibliography at Cambridge University Library in 2014. She recently set up as an independent bookseller (A T Scriptorium, ), and specialises, among other things, in the history of science, and recipe books including culinary, medical and alchemical recipes. She tweets as @ElixirLibri. 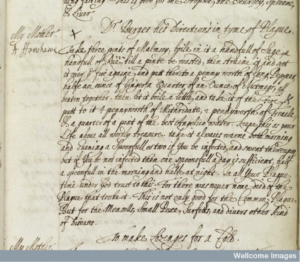 Manuscript recipe books were at the forefront of Henry Wellcome’s collecting activities. Perhaps no other genre of European written artefact spoke more directly to his conception of healthcare as the fundamental preoccupation of human beings. Indeed his first recorded Library acquisition in 1897 was a late 17th-century English manuscript recipe book. At the time of Wellcome’s death in 1936 there were probably between 150 and 200 such books in the collection, depending on how they are defined. Thirty of so of these came from the cookery book collection of John Hodgkin of Reading (1857-1930), purchased at Hodgson’s auctioneers in London in April 1931. Acquisition of recipe books fell away after 1936, in line with overall retrenchment in the development of the collections; but it is probable that this genre of manuscript suffered disproportionately as the focus of the postwar Wellcome Library and later Institute was firmly directed towards the history of scientific medicine and professional practice. Not more than a dozen manuscript recipe books were acquired between 1936 and 1986. There was no obvious scholarly interest in the history of domestic medicine, and it was not even clear that cookery was a relevant subject for a medical library. This was the position of the field when I came into post as curator of western manuscripts in 1991. I occasionally purchased manuscript recipe books for the Wellcome collection over the coming years – we had a generous acquisitions allowance and manuscripts of this type were fairly inexpensive – but I had little sense of developing an important research resource. The standout acquisition of the nineties, Lady Ann Fanshawe’s book (MS.7113), which has recently been the subject of a popular monograph, was purchased as much for its associational and provenance interest as its content, and the hammer price at auction of £2800 in 1995 (equivalent to just over £5000 today), which now seems nugatory, was deemed somewhat extravagant at the time. When cataloguing recipe books we more or less followed the pattern set by S.A.J. 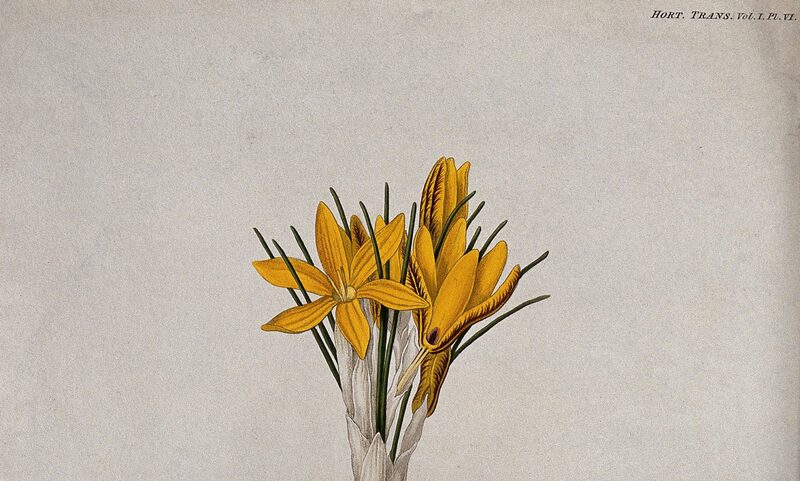 Moorat, who after the war had catalogued the items acquired in Henry Wellcome’s time: scant attention was paid to the nature and content of the recipes beyond a broad indication of whether they were medicinal or culinary. Little did I know that the growth of research interest in this genre of manuscript was already well under way, and not just in the productions of one or two ladies-bountiful, but in the wider practice of recipe-making and taking among the middling sort in early modern England. How I slowly became aware of this is now difficult to reconstruct: certainly it had nothing to do with proximity to the Wellcome Institute academic history of medicine department, where there seemed to be very little interest in recipes. It was probably largely owing to the growing number of researchers consulting our recipe books in the Wellcome Library, often Americans, and often coming from a literary studies rather than a medical history background. The phenomenon was sufficiently salient to lead me to propose a seminar series on recipes to the academic department’s programme committee, which duly took place in autumn 2002, and led in due course to the formation of the Medicinal Receipts Research Group the following year. In the meantime the evident research interest in recipes stimulated increased collecting activity, such that well over a hundred additional English manuscript recipe books have entered the collection over the past twenty-five years. Many more could have been added: indeed, along with the growing realisation of the research value of these books has been a recognition of just how ubiquitous this genre of manuscript must have been among the literate population of early modern England. formed in aggregate a substantial research resource that could be used by scholars to illuminate questions such as the circulation of recipes, the relationship between domestic and elite medicine, and the use of exotic drugs. Paradoxically the prices realised on the open market have not reflected the increased availability of manuscripts for purchase; if in the 1990s we could buy a solid if unremarkable late-seventeenth or eighteenth century recipe book for £350 or £400, this had increased at least tenfold by 2017. Such an exponential price rise almost certainly implies vigorous activity by a new generation of collectors building twenty-first century equivalents of the John Hodgkin cookery book collection. I am not aware of any other public collection in the UK that targets recipe books as a genre of manuscript. The price rise almost certainly means that the period of ‘heroic’ collecting of recipe manuscripts by Wellcome has come to an end. Henceforth acquisitions – of which there seems to be no sign of a diminishing supply – will no doubt be highly selective. In short, the Wellcome’s collection is to all intents and purposes complete.